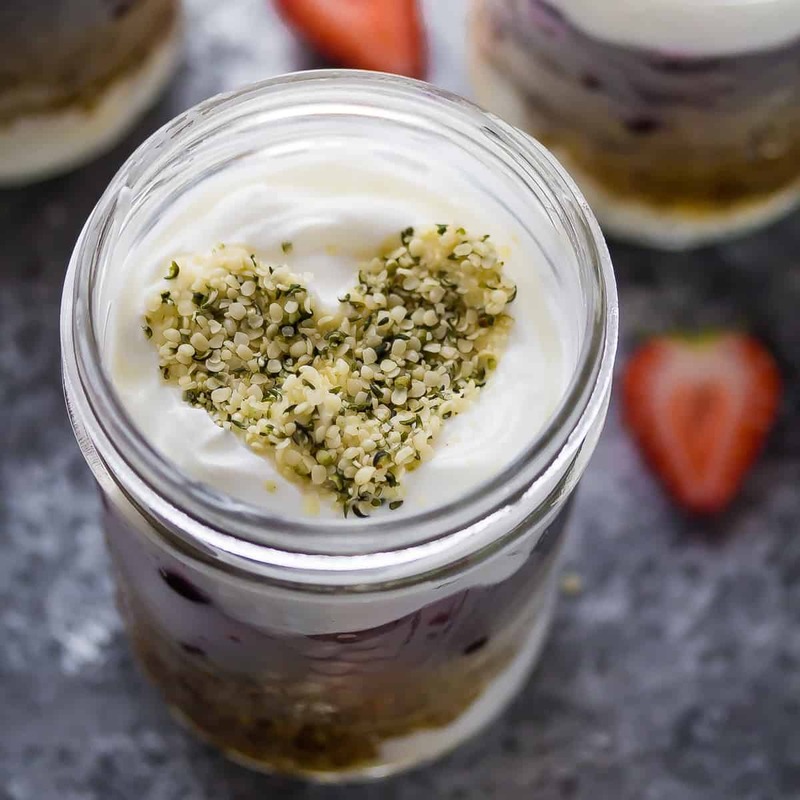 These easy meal prep berry quinoa yogurt parfaits are packed full of protein thanks to greek yogurt and a scoop of quinoa! One of the best things about having a kid is getting to relive your childhood through their eyes. But this year we have talked about Santa Claus and how he gets down the chimney, and we have to heave him some milk and cookies, and you can just see him processing this information…and it feels magical to me all over again! We have a big holiday bucket list including lots of holiday cookie baking, sledding (<– crossed that one off), Christmas light watching, watching all of Mommy’s favorite Christmas movies (<–already working our way through this one!). It’s fun for me all over again. Even humbug Ben is getting in on the fun…it’s contagious! I know you see a LOT of food bloggers sharing their favorite Christmas cookies or holiday recipes with you, but I’m keeping it pretty ‘normal’ around here…I just feel like you need to have your healthy recipes to balance everything out, right? Today I’m sharing a super simple breakfast recipe with you. If you can even call this a recipe. 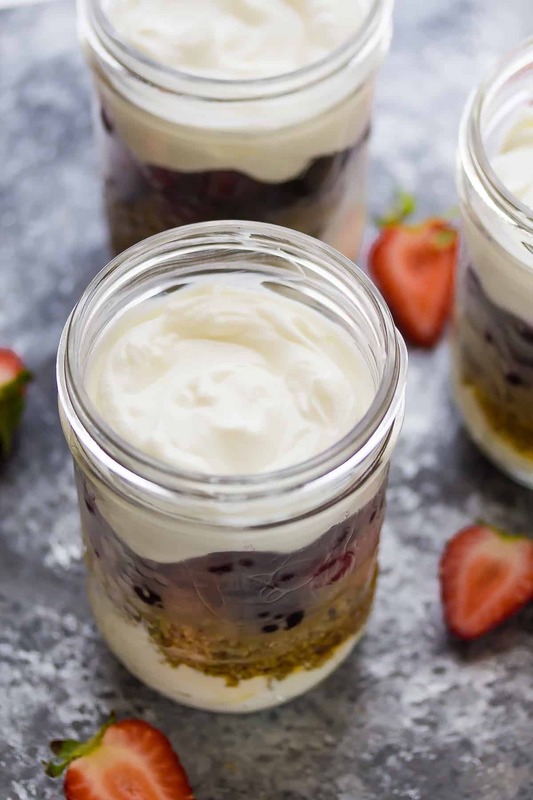 These high protein berry yogurt parfaits are one of my favorite meal prep breakfast ideas because they are just SO easy to make. All you really need to do ahead of time is cook up some quinoa (I cook mine in my rice cooker) and allow it to cool. ), top with the cooked quinoa, some berries and maple syrup, then some more yogurt. I topped with hemp seeds for an extra protein boost, but you can definitely leave it out if you’d prefer. These guys keep in the fridge for about 4 days. The quinoa holds its texture and I actually really loved it mixed in with the yogurt and berries…kind of a chewy texture (in the best kind of way). Not mushy at all. That’s it for today, friends. Be sure to check back on the blog on Sunday, I’m making us some delicious healthy comfort food! and these Healthy Freezer Breakfast Sandwiches are sure to be a hit! Cook quinoa according to package directions, and allow to cool completely. 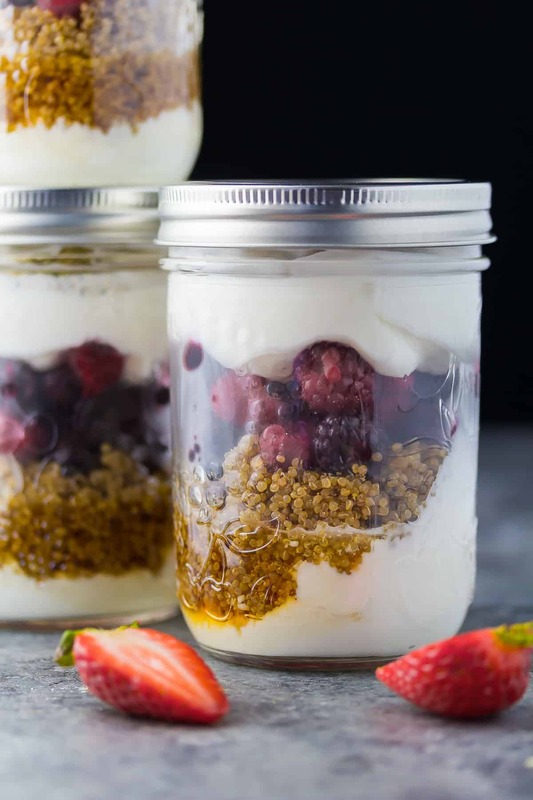 Assemble parfaits (I use wide-mouth 1 pint jars): yogurt, maple syrup, quinoa, berries then more yogurt. Sprinkle with hemp seeds (or add fresh if you want the crunch factor). Seal and store in the fridge for up to 4 days. Have you thought about making this with toasted quinoa for some crunch? That sounds delicious! I think you’d have to keep it separate to keep the crunchy but bet it will be amazing! 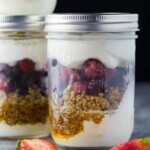 I made these parfaits last night, I had one before the gym this morning, they are awesome, so tasty! Awesome, so glad you enjoyed it, Phillippa! I love breakfast ideas that I can take on the go! Will definitely have to whip up a few of these!